In the 21 years Bill Heuson spent as Head Coach of Miami's golf team, he built up a tradition that has stayed with the team until the present day. Over the course of his career, Heuson led Miami to six undefeated season, and there were three other years when the record was marred by just one defeat. His record over those 21 years stands at an incredible 167-42. Not only was Heuson a great coach, but he was also a trend setter in Collegiate Golf. 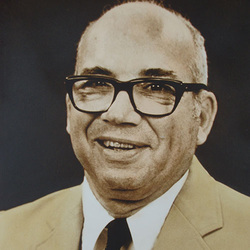 For 20 years, Dr. Heuson directed the UM Invitational Golf Tournament, and in 1972 he persuaded the NCAA to let Miami be a host University for that season's championship. That tournament marked a first for UM and for the state of Florida as a whole. In addition to coaching, Dr. Heuson was, and still is a Professor of Finance, and has served as chairman of the University of Miami's Finance Department.